The exhibition of Isotype children’s books that is currently on at the Department of Typography & Graphic Communication at Reading raised the subversive thought that it might be possible for the Isotype approach to be applied too thoroughly to a publication: was the stripping away of naturalistic detail and reducing humans to pictograms always appropriate in a young child’s book? Or was it a dogma, the application of the visual aspect of the Isotype system without thought for its context? 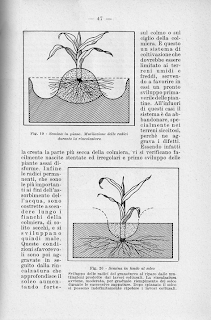 Looking at this book, a self-help pamphlet for Italian maize farmers, published in 1937, my sympathy with Isotype began to re-assert itself. 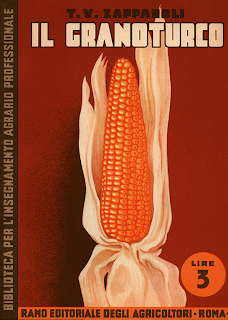 It’s easy to forget the norm of information publications for any age-group in this period: the design budget has clearly been spent on the cover, which is in the graphically strong idiom of the lithographic poster and the book jacket, with the corn-cob realistically rendered through airbrush work. The typefaces used for advertisements and display within the booklet are new and up-to-date, if in a moderne rather than truly modernist style. But the putting together of the text and illustrations is a mess: from the lack of headlines to the the way that the text has been reduced to a kind of porage flowing between unsystematically sized diagrams, it shows that it has been thrown together on the stone, not planned out beforehand. And the typeface for the text must have been antiquated even in 1937. Isotype’s dogma and careful strategy for every book they produced look a whole lot more reliable in comparison.